Crankbrothers is a long-time mountain bike brand that first made waves in the industry with their Eggbeater pedals, which fast became the darling of elite cross-country and cyclocross riders alike. Their small-platform Candy pedals are among the favorites for gravel riding in the Road Bike Action office. Mountain bikers have been using Crankbrothers wheels for cross-country to downhill riding and have been drawn to their unique and striking build. In hopes of branching out to the gravel and cyclocross world, Crankbrothers designed their Zinc 3 wheels as a do-it-all aluminum wheelset that won’t break the bank and still deliver solid performance. The aluminum Zinc 3 is a new wheel from Crankbrothers that borrows some technology from their burlier mountain bike hoops. The Zinc 3 uses this same Twinpair spoke design using stainless steel spokes that are laced to allow for quicker acceleration with the rotating mass closer to the hub. Crankbrothers designed the Zinc 3 with an internal rim width of 21mm and external width of 25.5mm best suited for tire widths of 32–40c. The Zinc 3 rim is designed with a deeper channel down the center and hooked walls to allow for easier tire installation. Crankbrothers uses a flange on the inside of the rim for the spokes to attach to, allowing for a completely sealed rim bed that is tubeless-ready. The hubs are available with a standard 11-speed SRAM/Shimano freehub body or XD driver. The Zinc 3 runs with 12mm thru-axles, but Crankbrothers includes conversion caps to go to standard QR. Retail on the Zinc 3 is $750 in a 700c diameter. We installed a pair of Maxxis Rambler 700×38 tires onto the rims, and they complemented the internal rim width well, although some of our test riders would have preferred a slightly wider design. Installation was easy, as the Rambler popped onto the rim bead without any issues. The unique design of the wheels are definitely more pronounced with their unique spoke design and lacing pattern. The Zinc 3s are a smooth-rolling set of wheels that offered our test riders a fair amount of vertical compliance. The burlier outside width of the rim added some extra strength when we encountered rocks and other adversity on dirt roads. When pedaling hard out of the saddle, the Zinc 3 was responsive and stiff, but not overly so that it affected the ride quality of the bike. The engagement on the rear hub was quick and didn’t give us any unwanted drag when rolling freely. During our testing we didn’t have any mechanical issues with the Zinc 3 wheels. There was little break-in from the spoke tension and was fairly hands-off in terms of extra maintenance. The weight, price and overall performance make the Zinc 3 a competitive option for aspiring or dedicated gravel riders. The easy-to-use tubeless rim provides no headaches or unwanted drama that can often make tubeless conversions a bit overwhelming. Our only real concern with these wheels are the proprietary spokes that could have some hurdles in case of an emergency. 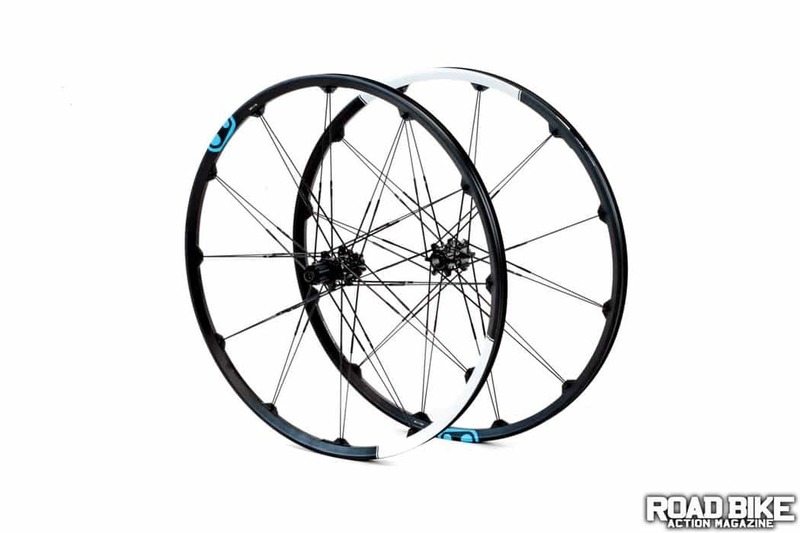 As long as you are prepared with extra spokes, the Zinc 3 will be a tough set of hoops to beat.